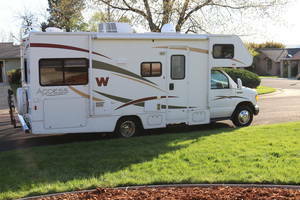 A Class C Motorhome is typically an RV with the living accommodations built on a cutaway van chassis. A full-size bed in the cabover section allows for ample seating, galley and bathroom facilities in the RV coach. Also called a "mini-motorhome" or "mini," lengths range from approximately 16 to 32 feet. Find your Class C RV from these sellers at RVT.